Handmade Jewellery for Beginners Starts This Week - Sign Up Now! Don’t miss your chance to sign up for my next class, Handmade Jewellery for Beginners, which starts this Wednesday, the 6th of February, from 6 – 9pm. 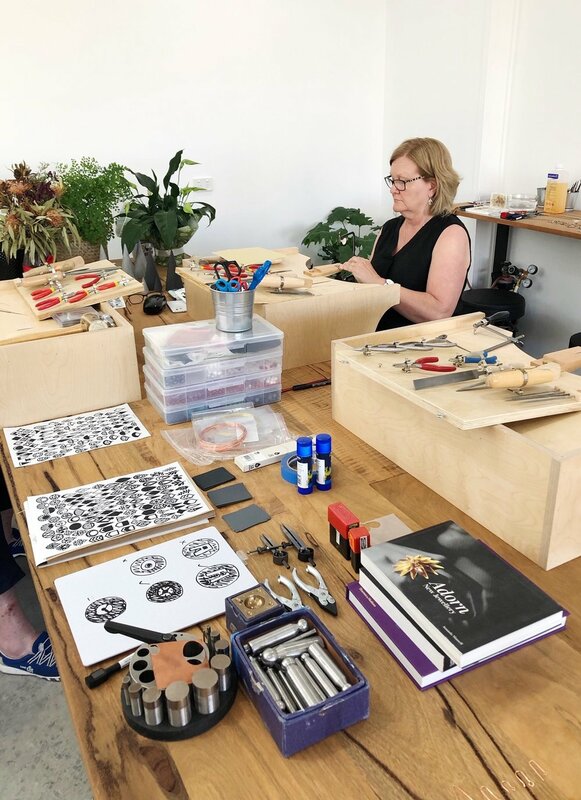 Running over 7 weeks, the class will begin with the basics of jewellery making such as sawing, soldering, filing, texturing and hammering and will end with each student designing and making their very own wearable work of art. Don’t miss your chance to sign up to begin your creative journey. My one day classes are also coming up very soon and are a great taster for those who want to see whether jewellery making is for them. Take some time our for yourself while hand making your own earrings or bezel set pendant within a relaxed and social environment. Examples of the wonderful goodies you might like to create during my one day class, Make Your Own Earrings. 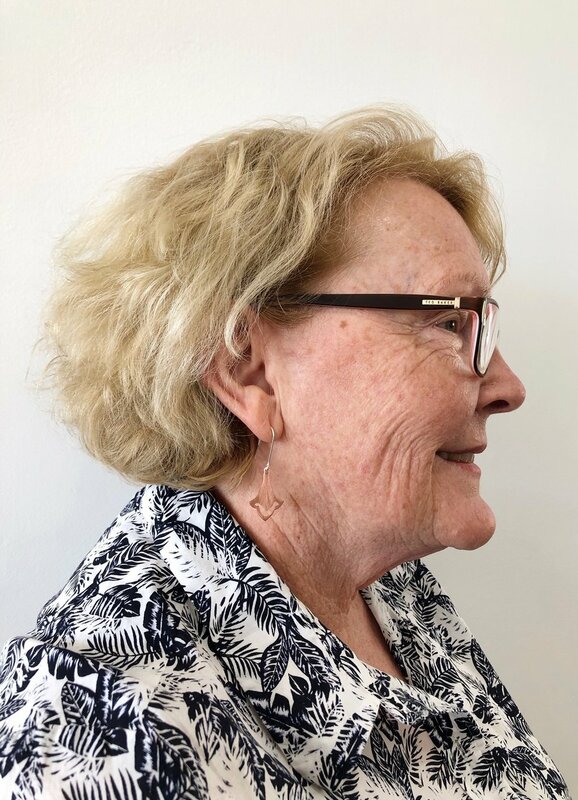 Make Your Own Earrings will be running on Sunday the 17th of February, 2019, and will run you through all the basics that you need to know to make your very own pair of earrings. Image is courtesy of Sue and Judy who had their very own private ‘Make Your Own Earrings’ class in January. Judy and Sue had never made jewellery before but were saw-piercing experts by the end of their class. They both left with a great new pair of earrings. During the class I will provide everything you need to make your own copper, brass or silver earrings. It has been a busy time down here at Glenelg South with some very exciting moments on the way. November brought with it some great commissions, a lovely launch party and even a little article in the paper. Term 1 classes for 2019 are officially online and ready to go. In addition to day classes where you can make your own earrings or bezel set pendant, I am also pleased to announce that my seven week beginner’s classes are now available. Handmade Jewellery for Beginners will run from 6-9PM on Wednesdays and is a great introduction to the world of jewellery making in a relaxed and social environment. Are you interested in making your own jewellery but aren’t sure where to start? Sign up for this seven week night course and learn the basics in a relaxed, social environment. Suitable for absolute beginners to those with more experience, this class is a great introduction or refresher to jewellery making. Do you have a friend or relative who already has everything? Gift certificates for jewellery workshops are now available in store or through the class page of my website and are sure to please. The lucky recipient can choose a date which suits them and vouchers are valid for up to three years, so there is plenty of time to book in. Material gifts are out, experiences are in! Treat that special someone with one of my beginners jewellery making classes and let them lose themselves in the joy of the handmade. 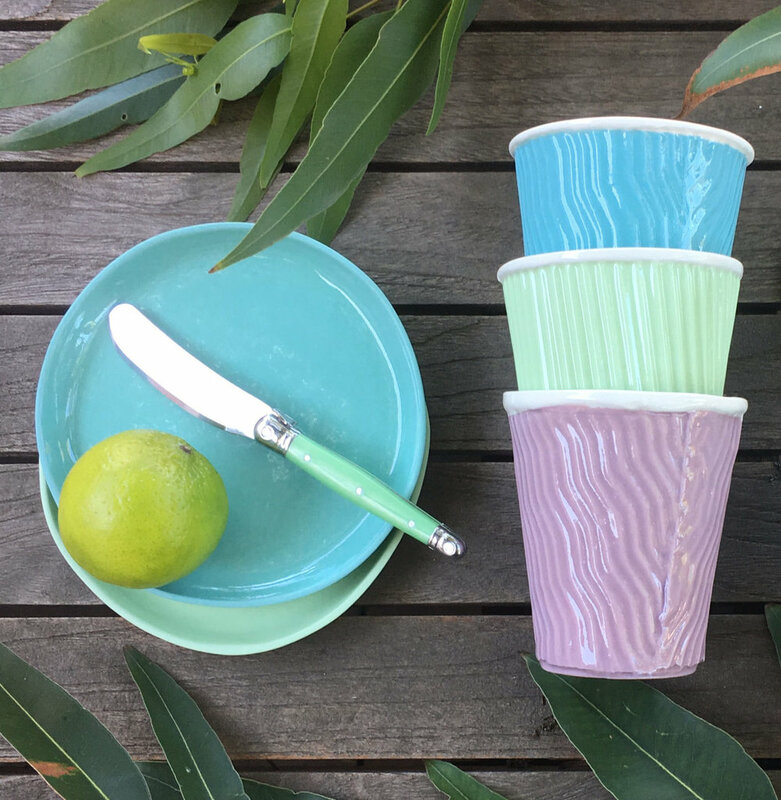 I am super excited to welcome Lilly Buttrose to be mentored at the studio gallery in 2019. 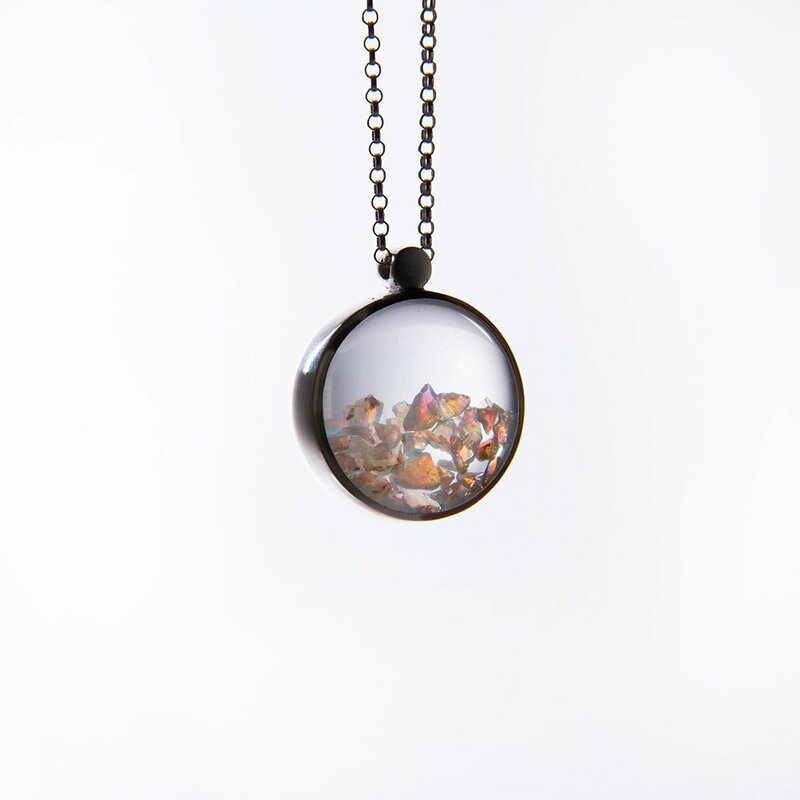 Lilly is a textiles and jewellery artist working from JamFactory, Adelaide, and is the proud recipient of a Carclew Fellowship. This fantastic professional development grant will allow Lilly to travel to Japan to learn specialised weaving at the Kawashima Textile School, Kyoto, and upon her return work with me to develop new ways to combine her beautiful textiles with metal. You can read all about Lilly’s grant in the recent article published by Adelaide Now. Lilly’s stunning woven earrings from her product range. During her mentorship, Lilly will further develop her jewellery making skills to explore new methods of transforming her textiles into wearable forms. Photograph courtesy of the artist. Lilly also exhibits beautiful hand embroidered wall hangings such as this linen piece, ‘Skyland Mountains.’ Photograph courtesy of the artist. Thank you to everyone who made it along to my official launch soiree. It was such a wonderful event and great to have the support of my local council, community, friends and family. Thank you also to Emma Fey from Guild House who gave the most amazing opening speech and to everyone who helped to make the night go smoothly. The launch party is underway at Claire Brooks Studio Gallery. Photograph courtesy of Laurence Coffrant. A colourful and delicious spread kindly prepared by Sylvia Nevistic, Courtney Jackson and Vesna Cavic. Photograph courtesy of Laurence Coffrant. The lovely Emma Fey from Guildhouse giving her opening speech. Photograph courtesy of Laurence Coffrant. I am extending my trading hours in the lead up to Christmas so that you don’t miss out on getting that last minute Christmas treat. The gallery will be closed then will be having a short break to work on some extra special commissions. Have a very Merry Christmas and happy New Year and thank you for your continued support! For much of the year I have been keeping a pretty huge secret and I am both ecstatic and relieved to finally share it with you! The lease is signed, the keys are collected and I am thrilled to announce that in August this year, I will be opening up my very own studio, gallery and teaching space in Glenelg South. Positioned perfectly amongst a cute little group of shops and just a short walk from the beach, the gallery will be a space for purchasing exquisite handmade jewellery and rediscovering your creative side. I am currently working with local artisans to help me with custom built displays and furniture and have been busily welding up some new goodies to make it my own. My little shop. There is lots to do but it will look great when its all done. There is a large room at the front of the shop where I will host classes, set up my studio and display my work for customers to see. Out the back is a smaller room, which will be used for heavier machinery and hammering, as well as a little veranda where students can enjoy a cup of tea in the sunlight. This new space is a great opportunity for a fresh start, bringing you all of the awesomeness promised in my crowd funding campaign, only better. 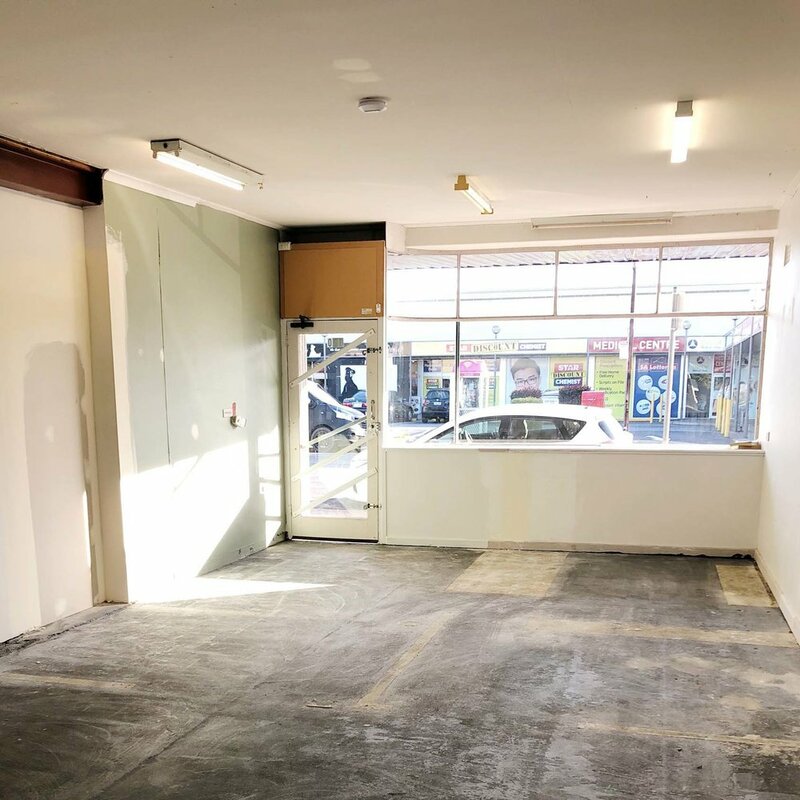 As originally planned, I still want the space to be inviting, nurturing and community orientated, however, I am also nutting out some potential extra features such as day bench/tool hire and an area where I can consult with clients. Having my own venue will also allow more flexibility to offer extra classes and specialty workshops with guest tutors in future. I've been welding up some new goodies for the gallery. Can you guess what these will be? Class dates and the big launch party will be announced in the not too distant future, so stay tuned and make sure you subscribe to my mailing list so that you don’t miss out! Thank You so Much for Making My Campaign a Success! And that’s a wrap! After a whole lot of preparation and a huge month, my campaign to start up a community teaching space at Karma & Crow Studio Collective has the highly coveted green tick of success. This project has been years in the making and I want to thank you all so much for generously donating as well as getting the word out there. Without you, I could not have made this happen and I am absolutely thrilled and humbled by your support. By donating, sharing my story or supporting me along the way, you have helped me take steps to sustain myself as a maker and contribute to my community in a meaningful way. Thank you so, so much! Ok, so the green tick of approval is actually white, but it's still awesome! The campaign has been such a wonderful opportunity to connect with long lost friends, family and students and I have even met some new fans. There are a number of people who helped me behind the scenes who I am so lucky to have in my life (you know who you are) and if I haven’t already thanked you enough, thank you some more! I can't wait to build on my growing collection of precision tools for my students to learn with. When making jewellery, good tools are absolutely crucial. Whoever said that a poor workman blames his (or her) tools obviously hasn't tried to mitre a perfect corner with a blunt file! For the next week or so I will be busily chipping away at finishing, wrapping and posting everyone’s orders, then the project can begin. I am elated at the thought of sharing my passion for the hand made with our community. Stay tuned for progress updates and information about the big launch in February, 2018! Microscope Earrings just after soldering. These little guys will be ready for postage next week. We are getting down to the pointy end of my crowd funding campaign. With only one week to go it’s so close that I can taste it! This week the campaign passed the 60% funded mark and sold out of large and small Microscope pendants which is absolutely amazing. Everyone has been so supportive and I am so grateful. If you haven’t already donated, don’t miss your chance to treat yourself to some beautiful jewellery or sign up for my brand new jewellery classes. Your donation will go towards setting up a fantastic new teaching space and will help me to sustain myself by doing something that I am truly passionate about. I still have some beautiful jewellery available through the campaign. Don't miss your chance to be rewarded for helping me to set up a beautiful new teaching space. Learn how to hand make your own jewellery by signing up for a class through my campaign page. Photograph courtesy of Perth Product Photography. If you can’t donate but would like to help get the word out about my campaign, please share the page with your friends and family. Just one share could really make the difference.